If you want to jumpstart your career in IT and networking by acing the Cisco CCNA exam, then this course is for you! It gives you a full understanding of all the concepts and topics you need to earn the most in-demand networking certification today by passing the Cisco CCNA Routing and Switching 200-125 exam. 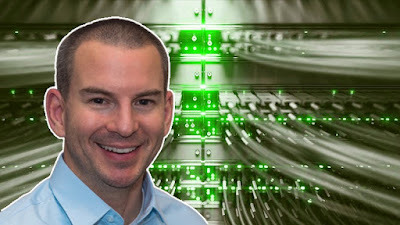 This course offers an easy to understand, structured approach to shortcut your path to mastering Cisco networking to the CCNA level and beyond. This course is chock full of activities. You’ll get over 300 pages of hands-on lab exercises with detailed answers to check your understanding every step of the way and build your configuration and troubleshooting skills. Full diagrams and lab setup files are included so you can get started immediately with just your laptop. No equipment or previous experience is required. All slides in the course are also included in supplemental flashcard format with expanded bullet points clearly explaining the technologies. Easily review exam topicsto solidify your understanding and get a final refresher when test day is approaching. In this course, you won’t just gain the book smarts to pass the exam. You’ll also hone your hands-on skills to succeed as a network engineer in the real world. I’m a professional instructor who has been entrusted by Cisco since 2007 to develop and deliver training courses for their own engineers and partners. I’ve also designed multiple training courses for the largest service providers in the Asia Pacific region such as IBM, Verizon, and the Australian National Broadband Network. I’ve spent years distilling my decade’s worth of networking experience from the field into mentoring and supporting other systems engineers, and I’m passionate about passing my knowledge of Cisco networks onto others. As a student in this course, you’ll get lifetime access to the course materials and answers to every question you ask in the Q&A board. I love interacting with my students: anything you want to know, please ask. The course also comes with an unconditional risk-free 30 day money-back guarantee–that’s my personal promise of your success. If you take a comparable course at a training centre it will cost you thousands of dollars, and when it’s over you can’t experience the tutorials again or ask the instructor any more questions. When you take my course you can learn anytime you want in the comfort of your own home, and I’m always here for you whenever you need any help. Not sure about the best way to pay for this course? Ask your manager at work if they’ll expense it. They won’t have to pay the large fees of traditional classroom learning or have to cover your absence for a week. They get huge value from this investment in your future. When you’re done with the course, you’ll have everything you need to crush the Cisco CCNA exam. I’m excited to share all of my knowledge with you. Join me on this journey to turbocharging your career! Anyone who wants to pass the Cisco CCNA Routing and Switching 200-125 exam and start or improve a career in networking. IT helpdesk engineers who are interested in careers such as network engineers, network administrators, systems administrators, or solution architects. This course can help start your career journey into these fields. Network engineers who are not Cisco CCNA certified or who have an expired certification. Even if you’re an experienced professional, you’ll fill gaps in your knowledge and master concepts like IPv6, EIGRP, OSPF, and BGP in this course. IT professionals who want a comprehensive resource on Cisco networking theory, configuration and troubleshooting. تم إنشاء الصفحة في 0.101 ثانية مستخدما 39 استفسارات.